Has your house been flooded, have you detected a water leak in your house, or experienced any other type of plumbing emergency? Once the emergency is handled, you may start wondering how to determine the extent of water damage to your home. 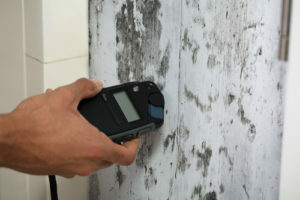 This is when you should seek mold inspection services in Laguna Niguel. Mold needs only 24 to 48 hours of water exposure to begin growing so the sooner you act, the more effective the remediation will be. While you are being unaware of its presence, mold will keep on spreading inside the walls. Toxigenic black mold is especially dangerous to humans and can cause a range of health issues so lose no time to examine and clean your Laguna Niguel home from mold. While waiting for your experts offering comprehensive mold detection services, along with efficient mold removal, you can try to detect mold in your walls yourself. Here’s how! If you notice moisture after you have been through a flood or have had another plumbing emergency, this means that your house has suffered a certain amount of water damage and it’s just a matter of time until mold and mildew start growing inside your walls. Even when you see mold on your walls and try to remove it, you should know that there’s a big chance mold is still there, growing in the walls, and remaining unnoticed. Contact a renowned water damage company offering mold detection services in Laguna Niguel. They will send experienced and skilled technicians to inspect your house and take all the steps to prevent further mold growth. To remove all moisture, these mold removal experts will probably have to remove and replace the drywall and get rid of enough dry material above the water line. Mold and mildew tend to leave an earthy, damp odor resembling the smell of decaying wood and leaves. This particular smell can differ depending on the type of mold growing in your house but you should be able to detect it quite easily. If there is any new smell in your Laguna Niguel house, you might need to investigate it a bit further and see where it’s coming from. Look into it immediately and see if you need to reach out to a trusted company offering mold detection services in your area. Although it might seem simple to detect mold inside your walls, oftentimes this fungus develops in hard-to-reach places, like behind your cabinets or shower. A water leak, flood and/or improper ventilation increase the risk for mold growth because of excess moisture. You should be particularly vigilant of hidden leaks, which are a common cause of damp in homes. Given that obvious leaks are much more likely to be spotted and dealt with in time, small leaks can grow into huge damp issues. A full-service water damage restoration company is your best option when it comes to leak detection and mold remediation. Mold often thrives undetected in warm and moist areas inside people’s homes. Keep it from becoming a part of your daily life! Call Emergency Home Solutions, a reliable water damage restoration company offering mold detection services, as well as mold remediation and water damage restoration in Laguna Niguel and other communities throughout Orange County. We are certified by the EPA for mold removal and are available 365 days a year, 7 days a week. Our trained and skilled technicians with vast experience are here for you 24/7 so if you suspect mold in your house, don’t hesitate to call us at (949) 356-0401 – anytime!